St.Peter's Engineering College, Hyderabad has advertised in DECCAN CHRONICLE newspaper for the recruitment of Teaching Faculty- Professors / Associate Professors / Assistant Professors Plus Non-Faculty jobs vacancies. Interested and eligible job aspirants are requested to walk-in on 20th, 21st and 22nd April 2019. Check out further more details below. How to Apply: Interested and eligible candidates are requested to attend the Walk-in interview along with CV, all originals & one set of copies of certificates and recent passport size photos to the walk-in address given below. Those who can't attend the wall-in, send resume to the email address given below. Walk-in Dates and Time: 20th, 21st and 22nd April 2019, 10:00 am to 04:00 pm. For Non-Teaching, only on 22nd April 2019. 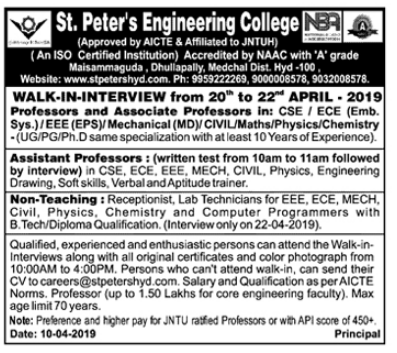 Reference: Recruitment Job Notification from St.Peter's Engineering College Hyderabad on DECCAN CHRONICLE newspaper dated 11th April 2019 for the recruitment of vacancy position such as Professors faculty jobs. See the copy of advt below.